‘Two of Surrey’s largest and longest-standing community choirs aim to raise the roof of Addlestone Community Centre as they perform a charity concert on Saturday 10th June. 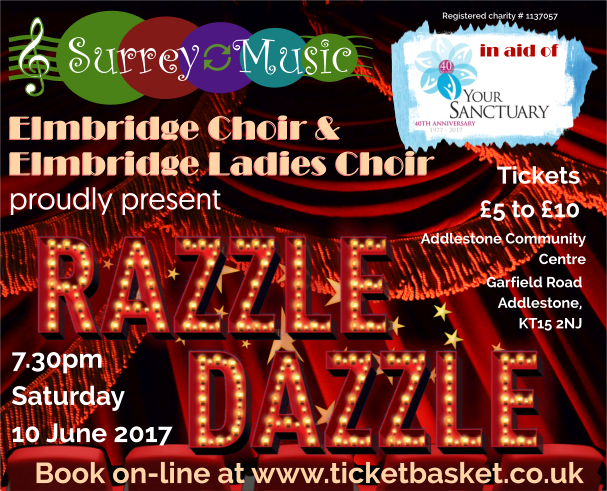 The 140-voice Elmbridge Choir and the 90-voice Elmbridge Ladies Choir will present ‘Razzle Dazzle!’ in support of yourSanctuary, a charitable organisation offering emotional and practical support to individuals who are experiencing or have experienced domestic abuse. With an eclectic programme ranging from the glitz and glamour of stage and screen, to bold, breath-taking choral pieces and contemporary pop and rock favourites, Surrey Music hopes the razzling dazzling spectacular will encourage a packed house and a receptive audience.